Seamless Production. Converting Book Production to Digital. Book publishers transition to digital print technology to accommodate lower runs and reduced inventory. With the proper digital print engines, finishing solutions, and workflow, print providers can run large batches of different titles without interruption. 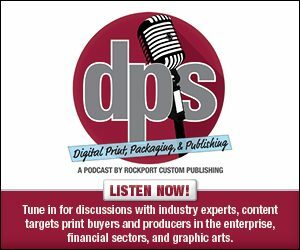 In this article, we speak with a print provider that acquired a publishing company to take advantage of the benefits of digital technology. Above: Headquartered in Annapolis Junction, MD, Ironmark offers creative and graphic design services, digital and offset printing, digital marketing, large format, logistics and warehousing, marketing strategy, promotional products, and website development. Headquartered in Annapolis Junction, MD, Ironmark began in 1955 as Frank Gumpert Printing. The company originally provided offset print production serving clients from the Maryland and DC area. Jeff Ostenso, CEO, Ironmark, took over Frank Gumpert Printing in 1992 with 22 employees and a 3,000 square foot facility. It rebranded as Ironmark in 2014. Ironmark currently has 170 employees and operates out of a 130,000 square foot manufacturing space. The print provider offers creative and graphic design services, digital and offset printing, digital marketing, large format, logistics and warehousing, marketing strategy, promotional products, and website development. It serves clients nationwide and has several international clients in Asia and Europe. “We are in business to provide our clients with a rock-solid partnership that leads to creative, effective results,” says Ostenso. The company is committed to staying on the leading edge of a changing industry and solidifying its position as a top choice for integrated print production, marketing, and communication services. The print provider’s vision is to be the catalyst for growth and success through communicating an image by which companies are inspired. “We’re nimble, fast, and focused because we know that our customers deserve one thing—great outcomes,” comments Ostenso. Ironmark’s interest in digital print technology started just before the inkjet shift became a common discussion for printers. “It clearly had potential to maximize productivity in a way that the industry hadn’t seen,” explains Ostenso. However, the company’s profile at the time didn’t justify the costs, so it went out to find the need. In 2015 Ironmark acquired United Book Press, a book publishing company. This helped them capture a piece of the inkjet market as it was just beginning. Ostenso says the company’s web presses were antiquated and Ironmark saw an opportunity to convert many of its book titles to digital. In that same year, Ironmark purchased the Ricoh InfoPrint 5000MP—a monochrome inkjet platform. The InfoPrint 5000 is a multi-purpose press designed to migrate print providers into digital at a personal pace. It offers high-performance monochrome with the ability to convert to full digital color in the future. The InfoPrint 5000 prints up to 420 feet per minute in B&W with a resolution of 720×360 dpi. Its ink management tools are designed to improve the accuracy of job estimates and monitor ink usage to lower operational costs. Water-based ink options and low power consumption help reduce costs. Ironmark’s first step with the InfoPrint 5000 was to convert the book titles to digital. “We knew the transition to inkjet and digital would be an ideal solution,” comments Ostenso. He believes the speed and runability of continuous feed inkjet allowed the company to be more efficient operationally and from a cost perspective. “We knew the InfoPrint 5000 would perform well and it has,” says Ostenso. Ironmark also uses a Canon Océ VarioPrint 6250, Canon Océ VarioPrint 6320, HP Indigo 700, and HP Indigo 3600. The company constantly evaluates media to ensure that it selects the best substrates to perform in the company’s environment alongside its applications while maintaining high levels of uptime and runability. Its primary focus continues to be book publishing, particularly print on demand books. The company primarily uses 40- to 60-lb Williamsburg and Accent media with Titanium 30 lb stock. “With these we find the quality remains constant even when the speed increases,” explains Ostenso. For finishing, Ironmark uses a suite of Standard Horizon finishing equipment including a Stitchliner, 470 Perfect Binder, 270 Perfect Binder, and HT 80 Trimmer. The company also has a Tecnau trimmer. The Standard Horizon 470 Perfect Binder is a fully automated four-clamp perfect binder that produces up to 1,350 bound books per hour. It binds books up to 2.5 inches thick and its interchangeable glue tanks support both EVA and PUR adhesives. The company’s software consists of Ricoh’s TotalFlow BatchBuilder with an Esko front-end PDF workflow. The TotalFlow BatchBuilder is designed for print providers and book manufacturers that produce one offs and short runs. It simplifies and automates short-run digital production by personalized rules programmed by the user. “When we’re running multiple titles, Ricoh’s BatchBuilder helps to achieve our runability and uptime expectations in the sense that we can run 30 different tittles without any interruption,” says Ostenso. Despite a successful integration of inkjet printing, Ironmark faced challenges when the technology was relatively new. At the time, many operators in the print industry weren’t trained in inkjet printing. The company had to train its staff from the ground up and implement an education process for inkjet technology. “Our technicians were eager to learn but there were many nuances we had to understand,” explains Ostenso. The learning curve took longer to overcome than the company originally anticipated, but it now has a solid team and other employees were cross trained. “We definitely know now that when exploring new technologies as we did with inkjet, we should be allotting extra time for education to ensure a strong comfort level,” says Ostenso. After acquiring United Book Press and adding inkjet to its capabilities, Ironmark had clear goals of how the transition from analog to digital would take place. According to Ostenso, the company exceeded its goals with the help of Ricoh. “We produce projects of a wider gamut, we are running consistently, and our uptime is great. Ricoh was able to look at our business and help us identify the best products to ensure we deliver for our clients time and time again,” he admits. Although the company has become accustomed to inkjet technology, that doesn’t stop Ironmark’s integration for the future. Ostenso is excited about inkjet’s various capabilities and range of markets. The company is currently exploring integrating more analytics capabilities with its digital campaigns to enhance data collection, with a goal of better understanding its customers and helping them better serve their clients. “We anticipate putting more emphasis on front end data in the future. And of course, cutsheet inkjet brings a world of new capabilities to any business, and that’s something we’re paying attention to as well,” comments Ostenso. In 2013 Ironmark began producing monthly statistical reports for the International Monetary Fund (IMF) using analog technology. The IMF is an organization of 189 countries, working to foster global monetary cooperation, secure financial stability, facilitate international trade, and reduce poverty around the world. Previously produced in analog, the IMF requests 900 monthly statistical reports of 900 pages. In September of 2016, the company converted the ongoing IMF project to inkjet. According to Ostenso, Ironmark can turn the project around in half the time as analog—four days from job submittal to delivery. Due to the page count and binding restrictions, the statistical report’s media must be lightweight. Using Domtar Titanium 30-lb stock, Ironmark prints 900 copies of the report every month on its Ricoh InfoPrint 5000 and finishes it with the Standard Horizon 470 Perfect Binder. Ostenso says the company chose the InfoPrint 5000 and 470 Perfect Binder for this project because of the equipment’s speed, flexibility, and media handling capabilities. Every month the project totals 810,000 printed pages. While it is always completed on time without challenges, Ostenso says that running 30 lb stock with a tight production window doesn’t allow for runability issues. “This is one of the best examples of the power of conversion from analog to inkjet. This job and time window was not possible in our analog environment,” says Ostenso. IMF continues to request monthly statistical reports from Ironmark and is impressed with the company’s ability to get the job done in four days. Using digital print technology, traditional manufacturers, publishers, and print providers meet faster turnarounds with little to no error. “We saw a huge opportunity with inkjet, and once we made the justification for the investment, we have seen impressive results,” comments Ostenso. While Ironmark satisfies its existing customer demands with its current capabilities, the company continuously explores how to further innovate its business with digital advancements.